This probate document comes without any provenance, other than it was purchased on EBay in April 2013 from a seller with an Norwich postcode (NR8). It relates to the settlement of an estate in the county of Somerset, but surfaced in Norfolk clear across the other side of England, so there is no apparent connection. The chain of custody for this document is totally unknown, so how do you tell if it is real and genuine? The risk of forgery is very low as the purchase price was less than £10, and the people involved were not notable. 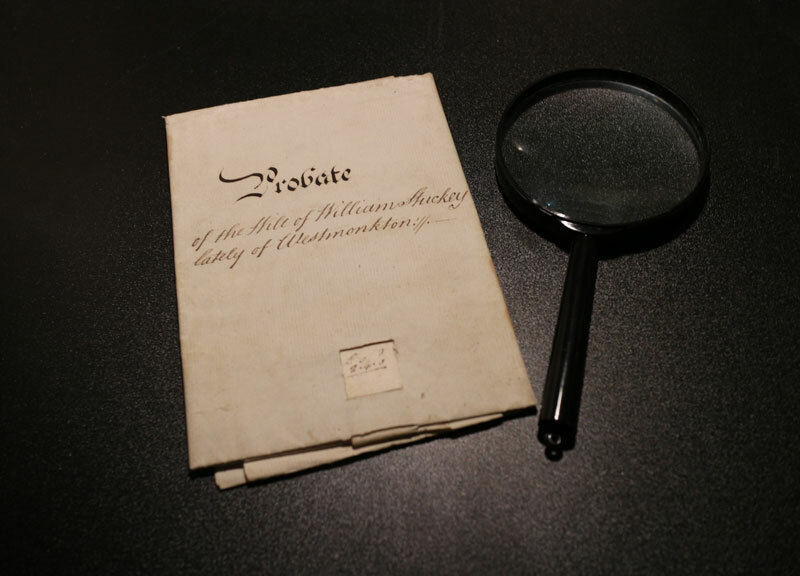 Documents that are decorative, connected with famous persons or grant significant privileges may command prices that would make forgery profitable. The legal and administrative procedures that produced this document have left clues about its authenticity in the form of a seal, tax stamp, content and materials used. The document is made up of several parts. A strip of paper passes through slits in the vellum and two paper sheets and is embedded in the wax seal, holding the parts together. In England, prior to 1858, the ecclesiastical or church courts dealt with probate matters. This will was proved in the Archdeaconry of Taunton. That is why it carries the seal of the Archdeacon of Taunton, John Turner. John Turner was first ordained as a deacon in 1756 and as a priest in 1758, by which time he had been qualified with an M. A. (Master of Arts) from Hertford College, Oxford University. He became Archdeacon of Taunton on 19 September 1780 and vacated the position on his death on 19 April 1817. 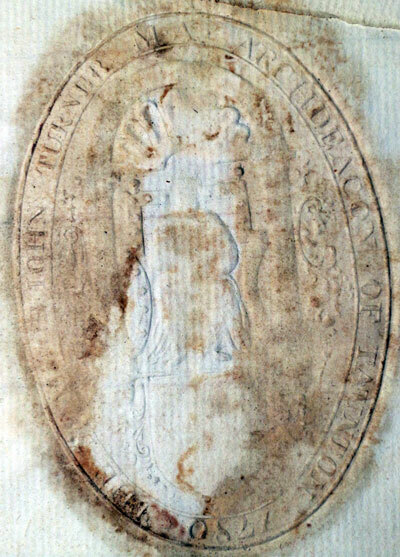 The seal is embossed with “THE SEAL OF JOHN TURNER M . A . ARCHDEACON OF TAUNTON * 1780 *”. Although probate was granted on the authority of the Archdeacon, the case was brought before Reverend Francis Hunt Clapp who acted as a surrogate or deputy judge. Francis Hunt Clapp was first ordained in 1786 and became a curate at Taunton St Mary Magdalen in 1786 and served as vicar there between 1803 and 1818. The careers of John Turner and Francis Hunt Clapp indicate that they served in Taunton at the time of probate, 7 July 1810. This is consistent with the document being genuine. William Stuckey made his will on 9 April 1810, in which he appointed his wife, Ann, as sole executrix. William signed the original will and two witnesses, James Thompson and Nicholas Thomas, authenticated it with their signatures and seals in William’s presence. These formalities guarded against concealment of the will or fraudulent substitution of it. After his death Ann presented the original will at the probate court. The court accepted that the will was valid and granted Ann the right to distribute the estate according to its terms. The grant of probate is recorded on the vellum sheet. The will, recorded on paper, is a copy. It is written entirely by one hand, and does not have any signatures or seals. Original wills were either retained by the ecclesiastical court, or copied into the court’s records and returned to the executor. In this case, the former is more likely. Vellum or parchment, made by curing calf or sheep skin, has long been regarded as a durable writing substrate suitable for important legal documents. The probate grant is an important original legal document. Vellum was more expensive than paper, so that may account for its use for the copy of the will. The paper used is hand-made laid paper, which bears a watermark: GOLDING & SNELGROVE 1808. Laid paper was made from rags (usually linen) which were pulped. The pulp was strained through a wire sieve in a mold, which leaves the impression of the sieve in the paper. Manufacturers of high quality paper incorporated watermark patterns in the sieve. 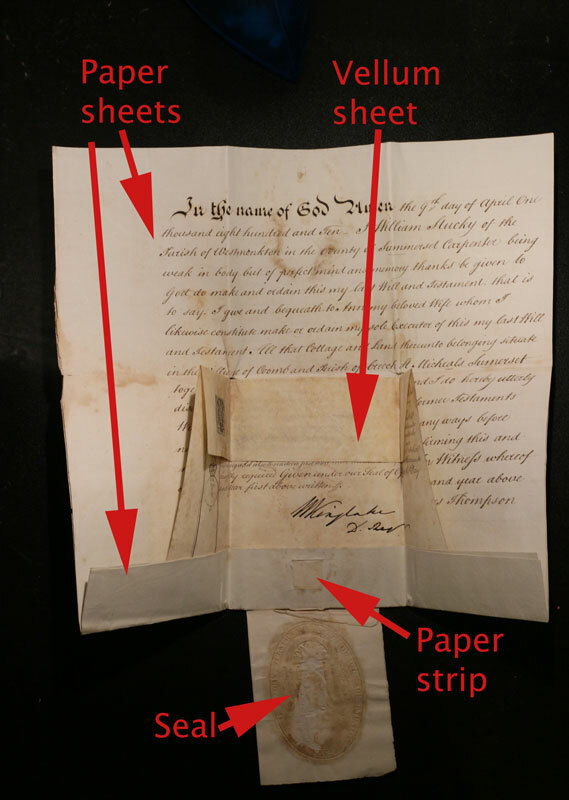 The use of vellum and laid paper dated to 1808 is consistent with a genuine document produced in 1810. The Stamp Act of 1694 first introduced the use of embossed paper stamps as a means of proving the tax on legal instruments had been paid. Without a valid official stamp legal documents could be rendered invalid. 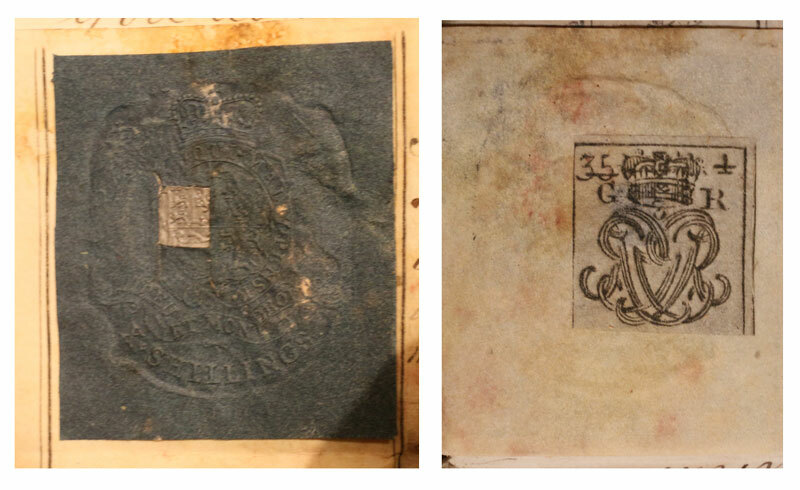 Vellum can’t be stamped, so the blue paper stamp was glued and stapled to the front and the paper cipher glued to the back covering the metal staple. The Coat of Arms on blue tax stamp appears to be the one used by George III between 1760 -1801. This is a few years earlier than the date of probate, but could still have been valid. Overall, there is substantial evidence that demonstrates this probate is authentic.